On Friday, I once again had the pleasure of being on Capital Account, live television with Lauren Lyster. I believe you can pick up the show on Comcast but it is not available on ATT U-verse, at least in my area. We discussed the latest jobs report, real wages, Keynesian stimulus, income distribution, taxes, and other topics. I come in at about the 3:00 mark, but the first few minutes of Lauren are entertaining as usual. Link if video does not play: What Happens When Jobs Rise But Leave Wages And Living Standards Behind? Here are a couple of charts from my Friday Jobs report (see Nonfarm Payrolls +171,000, Unemployment Rate 7.9%; Good All Around Numbers), that we discussed in the video. The index of aggregate hours paints a good picture of the stall in the recovery. Employment is up, but hours are not up proportionally. 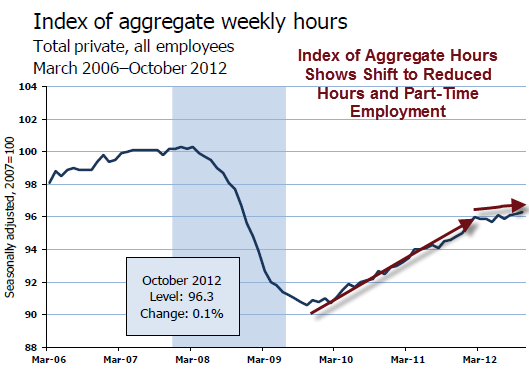 This reflects the trend to part-time workers and the reduction of hours in part-time workers. 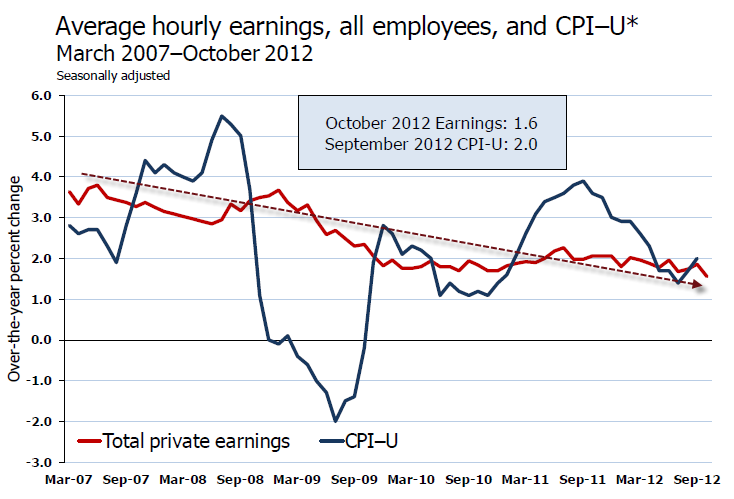 Average hourly earnings has been falling for years and lagging CPI inflation since September 2009. 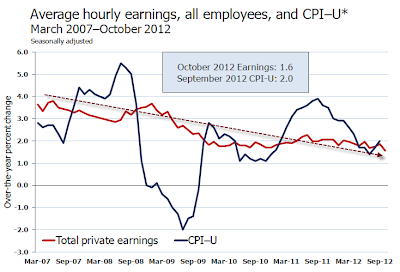 Simply put real wages have been declining. Add in increases in state taxes and the average Joe has been hammered pretty badly. We also discussed income and wealth distribution and what causes the inequity. In case you missed it, please check out my detailed description in What's "Really" Behind Gross Inequalities In Income Distribution? I had a fun time on Capital Account as usual, and will be back on the first Friday of every month to discuss jobs.